Mongolia, a group of Mongolian horseson the steppe road in the foothills of the Sayan mountains. Portrait of a reindeer in Mongolian taiga. Yurt camp in Grand Charyn Canyon National Park in Kazakhstan. 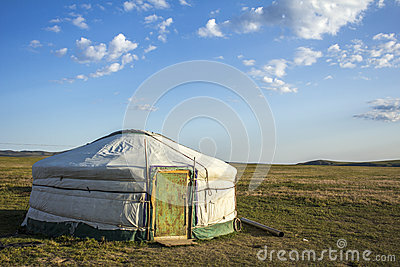 Fantastic Mongolian dawn overlooking the yurt - the traditional dwellings of nomads.